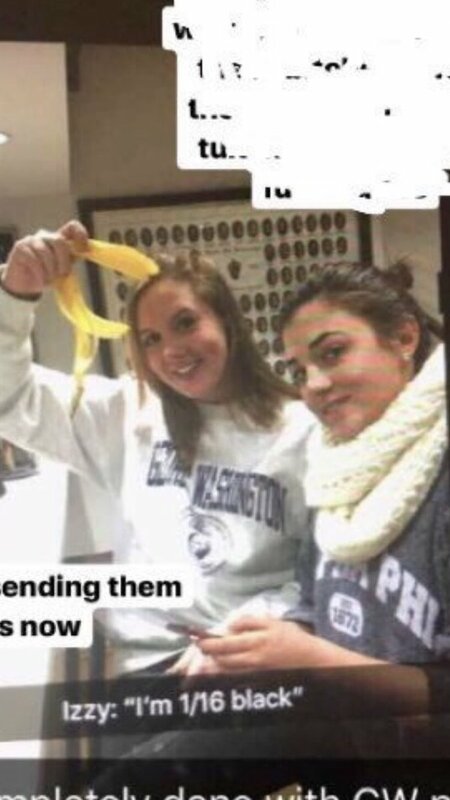 On the first day of Black History Month, two members of Alpha Phi sorority at George Washington University are under fire for a Snapchat post that shows them engaging in racist behavior, The GW Hatchet first reported Thursday afternoon. The photo shows two of the sorority’s members standing next to each other, one holding a banana peel. The photo’s caption reads, “Izzy: I’m 1/16 black,” quoting one of the members pictured. The photo began circulating in a group chat for students of color at the university and then spread to other social media platforms. The women's identities have been made public and neither of them posted the photo, according to The GW Hatchet. GW Student Association (SA) Senator Imani Ross tweeted a screenshot of the picture at 12:08 a.m. Thursday morning, calling on the university to address it. In the post, Ross specifically mentions Peter Konwerski, the vice provost and dean of student affairs at GW. The university replied to Ross' tweet, stating it will "look into" the matter. Hi Imani, we take this seriously and we’re going to look into it. Can we DM you for more information? GW Provost Forrest Maltzman, in a statement issued late Thursday afternoon, called the image "hurtful" and "disturbing." He said university leadership has contacted Alpha Phi national headquarters, as well as the students impacted. "We take this very seriously," the statement read. SA President Peak Sen Chua issued a statement condemning racist acts and promising to advocate for Black students. “The Student Association will advocate on behalf of students and work with University administration to ensure that black students feel safe and supported on our campus,” the statement read. Chua also noted that Julia Satin, SA’s director of Greek Affairs for Panhellenic and a member of Alpha Phi, resigned Thursday as the controversy unfolded. Satin is not pictured in the image. The incident drew criticism on social media. Executive Vice President of GW College Democrats Aly Belknap took to Facebook to express her distrust of the university, the sorority and the Panhellenic Association. There will be an Open Mic tonight for the community to come together and voice any and all concerns. The group will host an open mic event Thursday night in response to the incident for the community to voice its concerns. Abiola Agora, president of the GW chapter of the NAACP, said on Facebook that she is scheduled to meet with the university’s board of trustees and provost tomorrow. Elizabeth Jessup, president of the GW Panhellenic Association, said Alpha Phi and the university are both taking the incident seriously. Neither GW spokesperson for student affairs, Maralee Csellar, nor GW Alpha Phi President Alissa Laham immediately responded to requests for comment. The controversy comes after a series of racist incidents at college campuses in the area. Last May, bananas hung from nooses were found on American University’s campus, aimed at the historically black sorority, Alpha Kappa Alpha Sorority, Inc. That same month a white University of Maryland student fatally stabbed Richard Collins III, a Bowie State University student who was visiting friends in College Park. The student was charged with a hate crime.